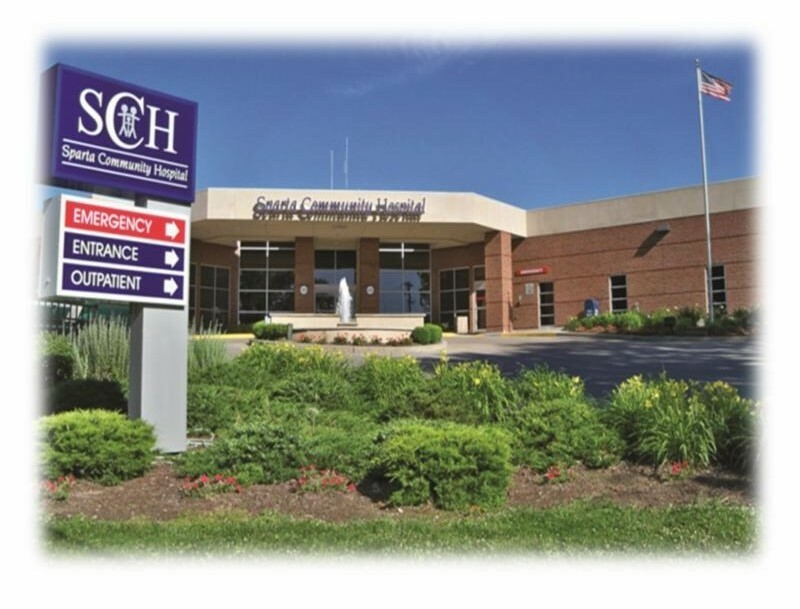 Sparta Community Hospital (SCH), located in Sparta, Illinois, is a 25-bed critical access facility offering a wide range of services including Surgery, Orthopedics, Cardiology and Emergency Medicine, a state-of-the-art Laboratory, and Diagnostic Services. The Emergency Department is open 24 hours a day, 7 days a week and is staffed by Board Certified contracted physicians, as well as a team of Board Certified physicians providing coverage for the Hospitalist program. Their service area encompasses a 25-mile radius including the local communities of Sparta, Steeleville, Coulterville, and Marissa. To meet the need of this service area, the hospital has established primary care physician offices in each of these communities. In addition, specialized services are located on the two Sparta Community Hospital campuses, including; Physical Therapy and The Center, a Specialty Clinic, Cardiology, General Surgery, Occupational Health and Cardiac Rehab. The Specialty Clinic is home to visiting specialists from the region and the greater St. Louis metro area including Gastroenterology, Orthopedics, Podiatry, Vascular, ENT, Plastic Surgery, Pulmonology, Rheumatology, and Urology. Sparta Community Hospital's Radiology Department boasts state of the art technology typically found in larger institutions. In addition to Digital Mammography and plain film x-rays; the department has 80 slice low dose CT scanner, 4D Ultrasound technology, and a nuclear medicine scanner as well as a PET scanner. Stationary, full-time MRI services are available. Mary Guyot, Principal with Stroudwater Associates, worked with Sparta Community Hospital in 2013 on a Care Management and Transition of Care (TOC) Project. RHPI staff spoke with Joann Emge, CEO, Lori Clinton, CNE, Ruth Holloway, QI, and Shawn Powers, UR, in January of this year concerning their progress. Q: Why did you choose to focus on care management/transition of care for your RHPI project? A: Everyone was aware of the financial effect that the wrong level of care would have on the patient and hospital, as well as process issues the re-work caused. We also know the future of CAH status and needed strong processes now if we are going to survive as PPS. A: Almost all of Mary's recommendations have been implemented. Much work has been done to address swing bed services. To assist the patient to have a better stay, an informational pamphlet for potential referrals was created. This provides information proactively concerning what to bring and what to expect in swing bed. One wing was carved out for this program to maximize patient privacy. They have an activity room, easy access to therapies, and families are encouraged to visit and share meals with the loved one. All departments who "touch" the patient have been involved in creating functional goals and fine-tuning documentation. The care plan document has been updated three times and there is constant review by a swing bed group that meets weekly. The hospital has created materials and packets for educating the public as well as healthcare providers about the swing bed services. To make it easier for patients to access care in their community, the hospital provides a dedicated phone line and they reach out to patients who have been transferred from Sparta to other facilities for care not provided onsite. The team worked hard to create smooth processes for admissions as well as identifying potential "readmissions" for the hospital. Concerning utilization review, supervisors have been trained to provide first-level review when UR is not in-house. "Cheat sheets" of common diagnoses and other resources are available. Staff is encouraged to take ownership and initiate changes. Sparta Community Hospital has worked equally as hard to impact the patient experience. All senior leadership make rounds in the hospital. The Emergency Department Medical Director is motivated and engaged to make changes. ER wait time is down and the transfer rate has decreased significantly. A: The hospital has made incredible progress on the outcomes for this project. Concerning patients in the correct level of care, the goal of 95% was surpassed and is currently at 97%. Readmission rates dropped from 13.9 to 8.8%. Emergency room transfers also dropped, from 8% in April 2013 to 3.6% in December 2013. Swing bed census moved from 2 in April 2013 to 4.13 in October, 3.33 in December, and 1 in December. HCAHPS composites have improved, most significantly "communication about medication" which moved from 57% to 91% currently. A: The hospital will continue to focus on providing resources and training to staff regarding utilization review and swing bed documentation. They also plan to implement department leadership rounding. A: The project was good for our organization and allowed us to focus on enhancement of a specific service with the assistance of consultation expertise. A: Staff attitude is amazing and everyone is very proud. This project helped to create a "shining star" for the hospital in the community. Staff is much more aware of the benefits to the patients of the swing bed program and it is top of mind as a resource.